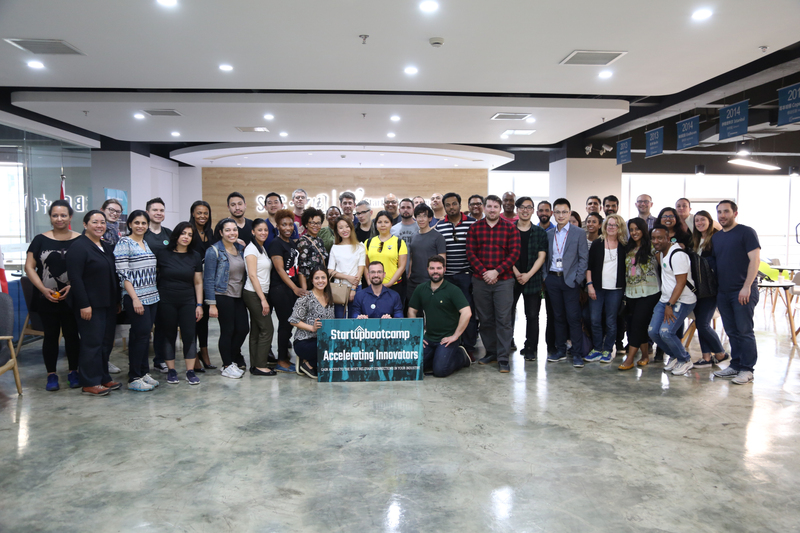 On April 12th, a group of special guests visited the SBC China Innovation Space – 4 professors and 47 EMBA students from New York City’s Baruch College. 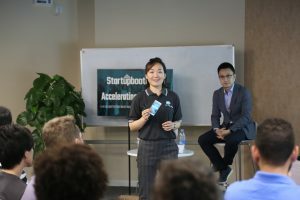 Together with SBC and three entrepreneurs they co-joined a sharing and discussion session about innovation, startups and the startup ecosystem in China.The group tours different cities and stops around China in order to gain an in-depth understanding of China’s business environment and experience China’s innovation and entrepreneurship environment. Next to Beijing and Shenzhen, the students specifically also wanted to visit Chengdu and learn more about the uprising city. Positioning itself as an open, innovative and attractive city to the world, Chengdu gained the attention of the group. Chengdu has more things to offer than just panda’s and hot pot! 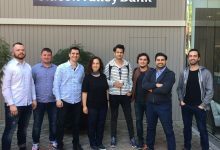 The two hours’ session was held in English and specifically arrange for the EMBA students. 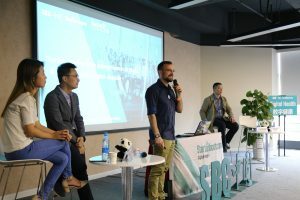 Speakers of the event, who shared their knowledge and expertise, were Cindy Feng (COO of SBC China), Erik Ackner (Program Director of SBC Chengdu), Kevin Xie (Founder of Ziibot), Robert Li (Founder of Decofun) and Anita Lai (Founder of Chengdu Food Tours). 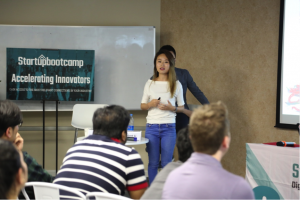 After welcoming the whole group, SBC China’s COO Cindy Feng kicked off with providing a general background about Startupbootcamp and Chengdu, then gave a glance about China in general, followed by the future of China based on policies and industry developments. 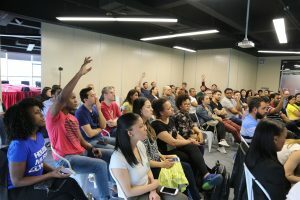 The sharing turned immediately into a heated discussion with lots of questions raised by the students to gain a deeper understanding about the market and China. Cindy introduced: “After 40 years of reform and opening up, the China’s economy has developed rapidly and has now become the second largest economy in the world today. In the past decade, China has actively promoted supply-side structural reforms, expanded effective supply, and improved supply quality. In the next decade, China will adhere to the science and technology-driven innovation, innovation-led development philosophy, and enhance the quality of economic growth. Q: How strong is intellectual property protected in China? A: At the national level, China is fully implementing an innovation-driven and high-quality focused development strategy, transforming itself from away from simple mimicking and importing innovation from foreign advanced companies. 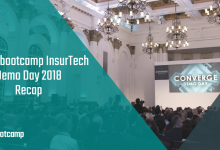 The path is clearly steering towards an independent innovation and endogenous technological advancement economy supporting strong local players. The Chinese government has also issued a series of documents and national policies to strengthen the protection of intellectual property to protect overseas intellectual property rights. 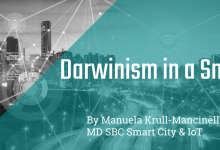 But this drive towards stronger IP protections is not only being pushed on the government level, also Chinese companies that are highly innovative strive to protect their inventions to keep their competitive advantage towards competitors. Thus the international cooperation in the protection of intellectual property rights has been continuously strengthened. It’s far more advanced and rigorous than many people might thing. Q: As Chinese government and enterprises vigorously promote the application of AI and Robotics, will it lead to an increase in China’s unemployment rate? A: In fact, China is facing an increasingly serious problem of aging population. In 2017, the proportion of China’s aging population was 10.8%, far exceeding the international average level. This led to the fact that China is facing a shortage of labor rather than a surplus problem. At the same time, China’s manufacturing and service industries are undergoing transformation and upgrading. In the process, they also need higher-capacity and higher-level labor. In particular, technology-intensive companies still face a large gap in the high-level labor force. To improve this situation, under a series of policies such as public entrepreneurship and innovation, the state and enterprises also encourage young people with professional competence and managerial ability to join in entrepreneurship, enhance industry upgrading and economy development. Ziibot— A 3D pulse scanner based on AI. It can do pulse diagnose in just one minute. It helps us to know the health risks in advance. Kevin, the founder of Ziibot which is one of SBC China’s 2017 Digital Health startups, showcased his business for the visitors from the US. 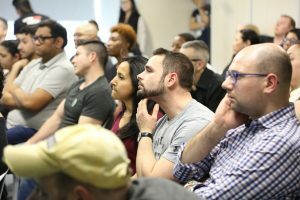 He explained details starting from product design, application technology, business model, competitive landscape, got to market strategy, and the future development. 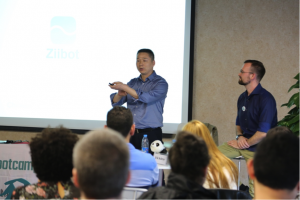 After questions from the audience he also shared more details about challenges faced, benefits of traditional Chinese medicine and functionality of Ziibot’s device. 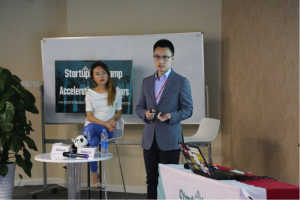 The second entrepreneur in the round was Robert Li, the founder and CEO local Chengdu startup Decofun— a data driven online platform for interior design and home décor. 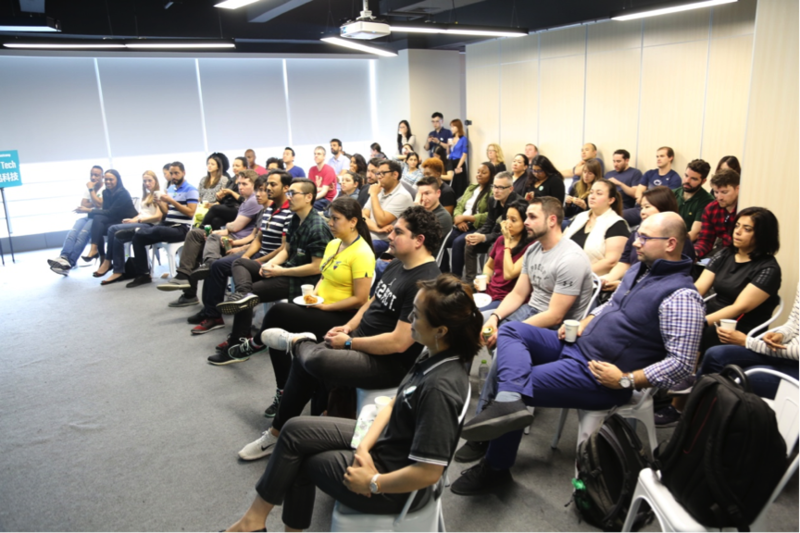 Robert shared his view and philosophy of entrepreneurship which he gained from experience in investing, joining Draper University and starting his own business. The last entrepreneur in the group was Anita Lai who presented Chengdu Food Tours. This local business is designing food experiences, workshops, trip and events that help to give foreigners an insight into Sichuan’s unique food history and culture, as well as its amazing tastes. Q: What are the biggest challenges encountered during starting up your own business? A:Kevin stated that the current diagnosis technology of traditional Chinese medicine is a controversial medical treatment. So far there is no scientific proof of the existence of the meridian system. 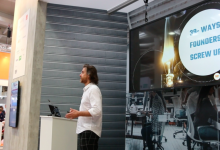 But with their device and clinical tests, Ziibot is working on publishing papers to educate the market. So far this concern has hindered the market penetration in the early stage. However, Kevin firmly believes that the use of innovative technologies such as big data and artificial intelligence will bring big opportunities for the diagnosis of Chinese medicine and ultimately contribute to the global promotion of it. Q: Which channels do you use to advertise in China? A: The most common way is through own social media accounts such as on WeChat, Weibo or own blog. It’s important to slowly cultivate a follower base that then slowly can turn into customers of your products and services. Once you have real fans, they will be happy to share their experience and help you to spread by word of mouth. 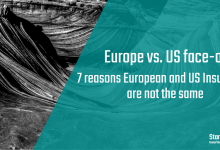 The channels and tactics are similar to the west, just the tools are different. Anita suggested that in China, the influence of Key Opinion Leaders is huge and has to be included in the promotion strategy. 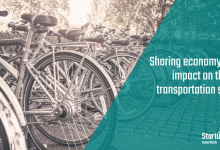 Cooperating with those KoLs can push your brand into a new level and bring a large fan and follower-base to your platform. After two hours of hot debate and discussion with almost 40 questions asked and answered, Erik thanked everyone for joining the session and invited the students for a final group photo. Cindy also sent an invitation to all students on behalf of SBC China to “Welcome to join the SBC Scale Chengdu Program! 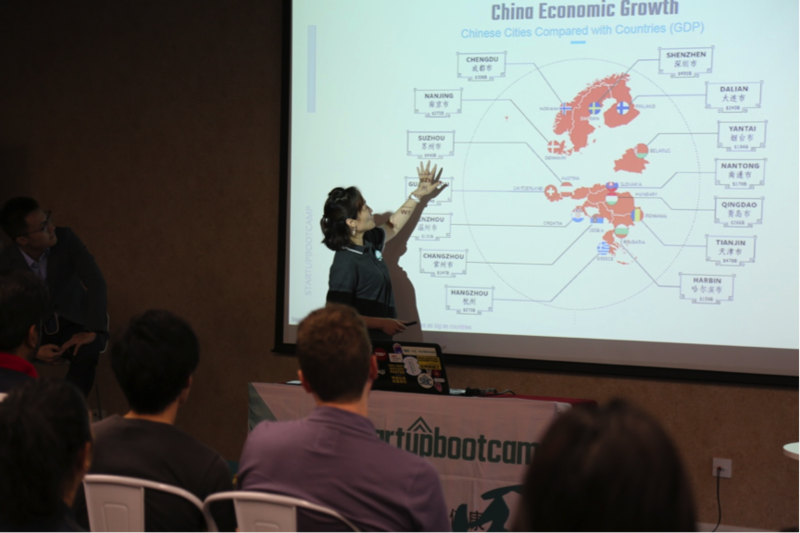 If you have a great project and want to expand and develop in China, please let us know and we will try to help you scale it here.